Errata available: Elongated Stitch Row 1: (RS) Knit. Row 2: Purl. Rows 3 and 4: Knit. Row 5: Knit all sts WRAPPING YARN TWO TIMES around for each stitch. Row 6: Knit the first wrap and drop the extra wrap, thus elongating the stitch. 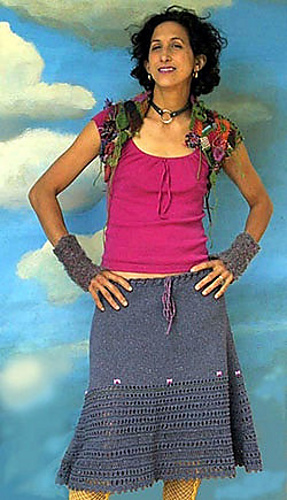 "Cotton skirts are fun to knit and wear, especially in the lazy days of summer. This one has a drawstring waistband, an A-line shape and easy eyelets decorating the bottom half that show just enough skin. The garment is knit in two pieces and sewn together at the sides. Feel free to use any cotton you like in a worsted weight."